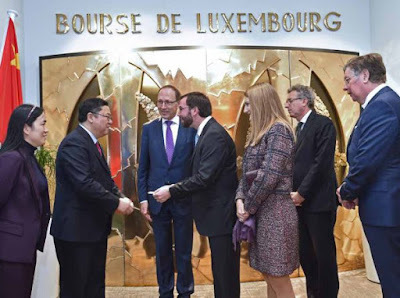 Hereditary Grand Duke Guillaume and Hereditary Grand Duchess Stéphanie paid a visit to the Luxembourg Stock Exchange, or Bourse de Luxembourg, today. The couple was accompanied for the visit by Pierre Gramegna, Minister of Finance, and were received by LuxSE officials. The Hereditary Grand Duke and the Hereditary Grand Duchess, who was wearing Diane von Furstenberg, attended a presentation on the history of the Luxembourg Stock Exchange, its activities today and its subsidiary, Fundsquare. The couple also visited the markets and surveillance room as well as the exchange’s IT surveillance centre and Fundsquare, where they received further explanation on the functioning of a modern stock exchange. They also greeted a delegation from the Shanghai Stock Exchange, which included Hongyuan Huang, Shanghai Stock Exchange President, who were also visiting the Bourse de Luxembourg for the day. More pictures at Tageblatt and Wort.